This entry was posted on October 26, 2013 by Tintean Editorial Team/fdg, in News, Of Literary Interest, Theatre Notice, What's On.... Bookmark the permalink. Gourmet meal on One Tree Hill. Wayne Pearn as Monk O’Neill. Photo Bernard Peasley. Bloomsday in Melbourne will stage, with the permission of Jack Hibberd, his monumental comedy, widely regarded as a classic of (Irish) Australian play-writing. Wayne Pearn, under the direction of Renee Huish, reprises a memorable Monk O’Neill, the recluse of the Western District, would-be Don Juan, and linguistically precocious ponderer of the meaning of life. 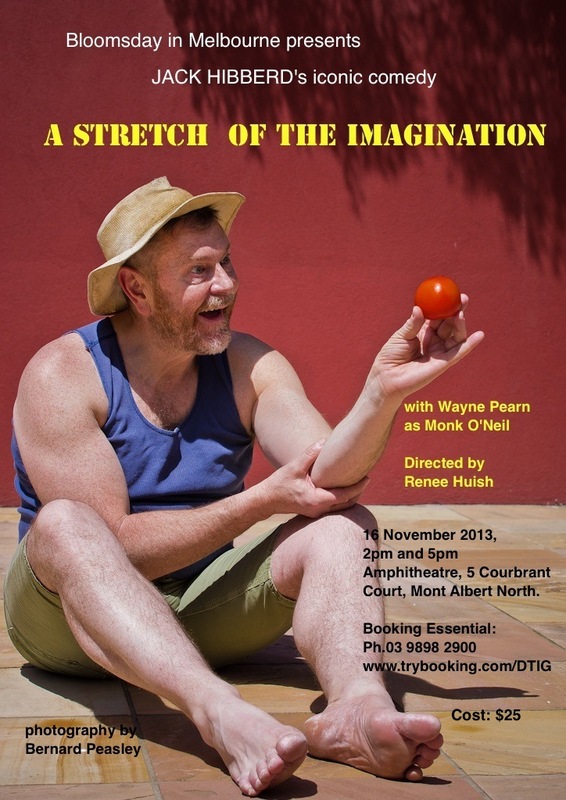 When: 2 performances only on Saturday, 16 November 2013, at 2.00pm for 2.30pm and 5.00pm for 5.30pm. A drink and nibbles before the show. Where: The amphitheatre, 5 Courbrant Court, Mont Albert North, Vic. 3129 (Melways 47A5). Parking in streets adjoining. Bus routes 201 and 302 close by at Boondara Parade and Belmore road.